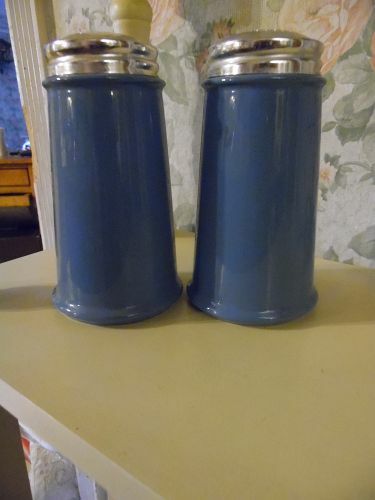 Huge salt and pepper shakers made of a beautiful delphite blue glazed china, and has shiny aluminum caps. Holes spell S & P. These are so big they will hold a half box of salt or a economy size pepper. Measures 5 3/4" tall. Pristine condition. You will love them. Nice sizes holes too. LIKE NEW. 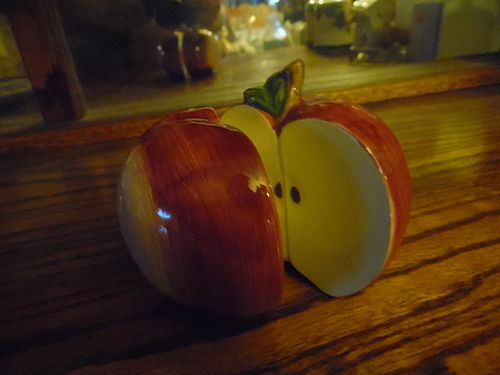 Nice life size apple salt and pepper shakers. Made od hand painted ceramic with original stopper. Very nice condition. Made by CIC Susan Winget. 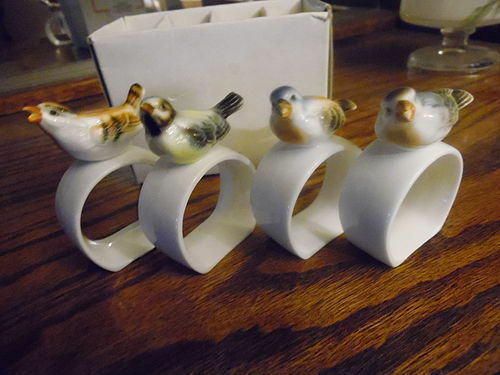 Partially boxed, set of 4 porcelain bird napkin rings. Each is a different bird and is nicely detailed and realistic looking. Made by House of Global Art. Each is in perfect condition. Sold as a set. 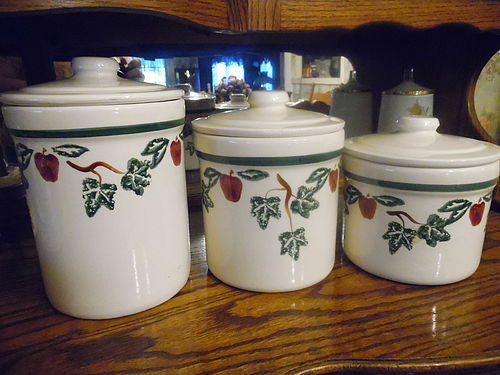 Nice Three pc set of canisters complete with lids. Lids have freshness seals which make the canisters more airtight and also helps prevent chipping. 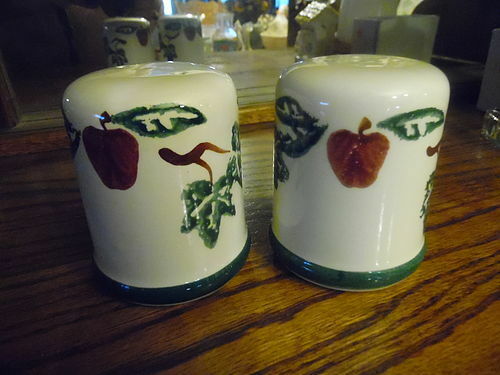 Decorated with crock shop's Apples and Ivy pattern. Wonderful condition with no cracks, chips or repairs. These are all in wonderful condition with no chips or cracks. Crock shop is no longer in business and was a California based Co. Please send zip code when inquiring so I can calculate shipping. Nice fat range salt & pepper shakers measure 4" tall and have the original stoppers. 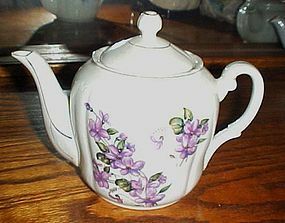 Decorated with crock shop's Apples and Ivy pattern. Wonderful condition with no cracks, chips or repairs. 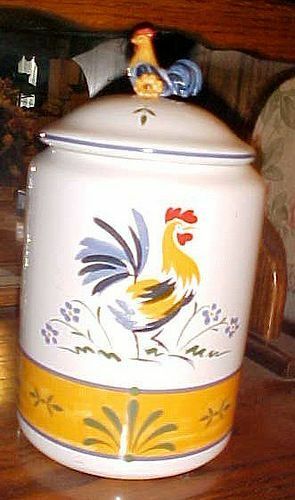 Crock shop is no longer in business and was a California based Co.
Avon The Provencal Collection Rooster canister 11"
Avon 11" tall canister from The Avon Provencal Collection Rooster. Hand painted colors of green and yellow. Made of ceramic and has a little rooster finial on the lid. Nice condition but there is a small chip way down on the inside of the lid. 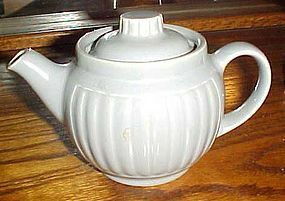 Very pretty for your country kitchen. This is large enough to use as a cookie jar. 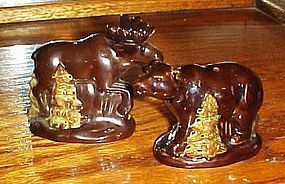 Wonderful salt and pepper shakers for your kitchen. Not sure if these are cherries or apples. Measures 4 1/4" long. 2 1/2" tall Pristine condition and original stoppers. Here ya go ladies.. a vintage crock pot 1969. 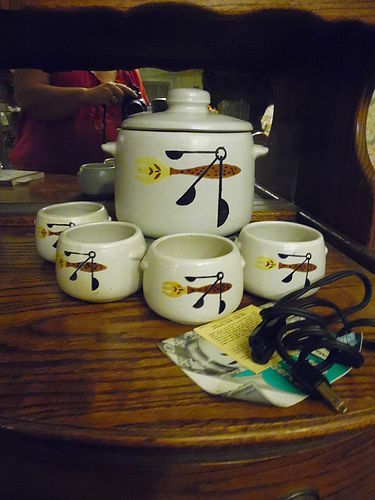 This West Bend Bean pot comes complete with booklet, heat plate and 4 matching bowls.original cord, and instruction-recipe Officially called their "Buffet Patio Server". Pristine condition. Please include zip code if inquiring about shipping costs. 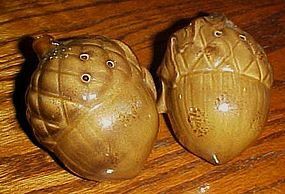 These are the largest acorn shakers I have seen, Nice brown drip style glaze. Measures 2 1/2" tall and are 3 1/2" long. Pristine condition with original plastic stoppers. 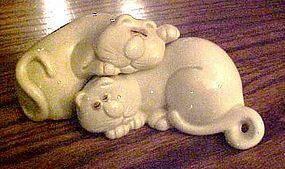 Fitz and Floyd Cat Nap Salt and Pepper Shakers.From a 1970s animal series, these pieces are from the cats. Two shakers of sleeping kitty cats intertwine when not in use. They measure 2 1/2"high x 4"high and 2"high x 4"wide. In very good used vintage condition with no damages and have original stoppers. 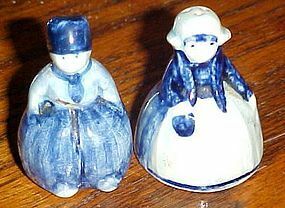 Adorable old vintage set of miniature salt and pepper shakers measuring just 2 1/4" tall. Blue delft porcelain and has original cork stoppers. Perfect condition, no markings. 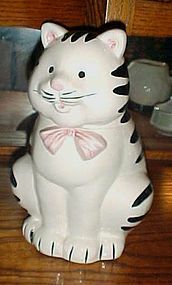 Cute black and white striped kitty cat cookie jar. She wears a pink bow tie. Marked RM in the mold. Measures 11 1/2" tall. No chips or damages. There is a amall 1/4" crack under the glaze (by the tie) that does not go through. (a factory flaw, that was glazed over). This little tabby longs for you to take her home and keep her tummy full of cookies. 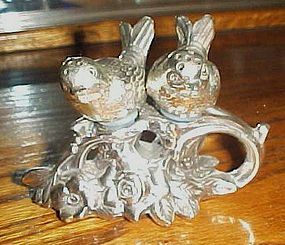 Metal birds on a branch silver plated salt and pepper shakers. 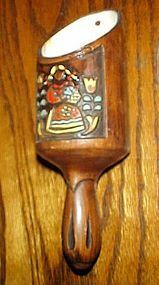 Measures 3 1/2" tall and is 4 1/4" long. Nice condition with nice plastic stoppers.